MatOrtho® is identified as an outstanding organisation. 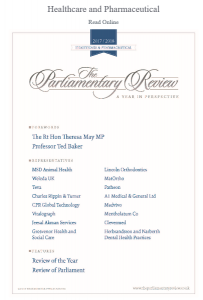 Professor Ted Baker joins the Prime Minister to offer forewords for this years Parliamentary Review publication as MatOrtho® features alongside 15 other healthcare and pharmaceutical organisations. Follow the link to read the article where Mike Tuke introduces MatOrtho, discusses the success of our products and shares the importance of safe innovation.